If you want a colourful and fresh garden this can be achieved without hassle, even by a novice gardener. To start you off, here are the five easiest plants to grow, and they will provide a bright and bountiful outdoor paradise. This pretty plant is a low-grower and blooms so abundantly that it appears like a carpet of tiny, white flowers. It has a delicious, sweet fragrance that is perfect for any summer garden. 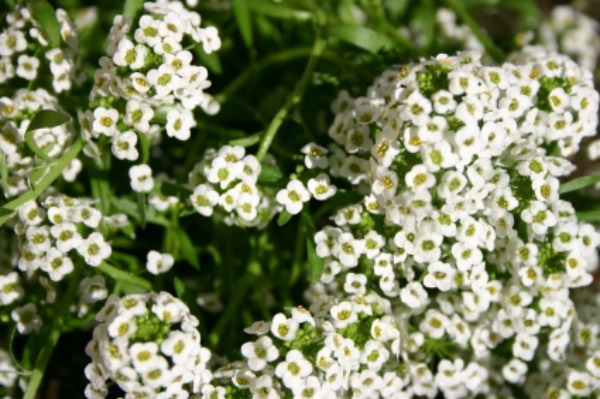 Because of its low height level, you should plant alyssum around the front of your bed or border. This flower family has an abundance of choice for every season and the great news is that each variety is easy to plant and grow. Whether you go for daisy-like blooms or exuberant multi-petalled pompons, the varied colours and options make aster a great addition to any garden. A classic flower, clarkia can grow from seed to bloom in just 10 weeks after sowing, giving you an easy and almost instant option to brighten up your garden. Clarkia’s shades of pink, red, lilac and white offer a rich colour palette for your garden. This is one of the easiest plants to grow from seed. Scabious has many small flowers blooming from a single head on a tall stalk. Its nectar-rich flowers, which are a magnet for bees and butterflies, come in soft lavender-blue, lilac or creamy white, bringing not just colour, but life to your garden too. This underdemanding plant is a popular garden flower that grows from seed preferably sown in a sunny spot. It will self-seed each year so there is no need for replanting. Zinnia flowers are in a variety of shapes from a single row of petals to a dome. Yellow, deep orange, red, purple and lilac varieties give you endless choice for your garden.